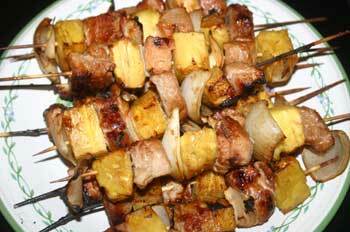 Last week, you may recall the chicken kabobs that I showed you on Friday. We had those in Vicksburg with my husbands high school classmate Susan and her husband Richard. They were so good. I decided to try the same sort of thing with pork. First I marinated cut up a tenderloin into chunks. 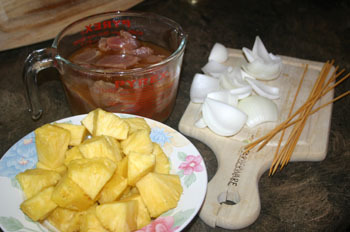 I then marinated the pork chunks in a mixture of pineapple juice, soy sauce, garlic and onion for about 8 hours. At that point, they were ready to assemble. While I assembled the kabobs, my husband started lighting the charcoal and mixed a little apple wood with it. 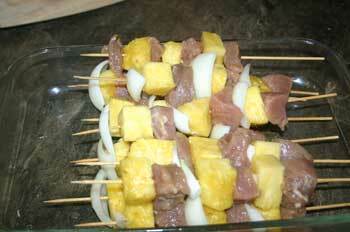 I threaded the pork onto bamboo skewers that had been soaked for 30 minutes with pineapple and onion. You could use bell pepper or other veggies with this as well. Here they are ready to go on the grill. The grilled for around 5 minutes each side. While they grilled, I made some rice to serve with them. Here they are hot off the grill. Served with a salad, this made a really easy and delicious meal. Now, I’m going to try to plant the crown of the pineapple and see what happens! The trick to perfect rice seems to be in cleaning it first. To each cup of rice, add 1 1/2 cups of water. First clean the rice in cold water by placing the rice in cold water, swishing it around and then draining it. Place the 1 cup of rice to 1 1/2 cups of water in a pan. Add 1 to 1 1/2 tablespoons of butter, if desired. Bring to a boil. Cover and simmer for around 30 minutes or until water is absorbed. Those kabobs look absolutely awesome! Thanks for sharing. Your kabobs look scrumptious! I love love LOVE pineapple. Can’t wait to hear if the crown takes!! Good luck. Oh I love Kabobs!!! I am always looking for new ways to do them too! Thanks for the recipe!! Such a great blend of flavors. Thanks so much for sharing. 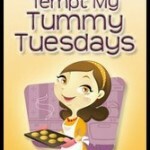 I hope you will join me at diningwithdebbie.blogspot.com for Crock Pot Wednesdays. The giveaways this weeks are really great! Great idea! Yummy and nutritious! These look so good. 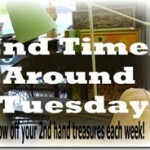 Great mix of items too. This looks incredible. I LOVE pork tenderloin !!!! I am not a big eater, but these kebabs would stir my interest! They look bite size and certainly delicious! I have some colorful peppers what do you think about using them with the chicken? I love kabobs! These look great! 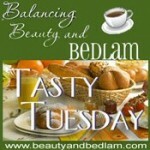 Thanks for linking up to TMTT. Wow, these look delicious! I usually make them with chicken, but now I’m dying to try them with pork. Thanks for the recipe.